Be kind to one another, compassionate, and mutually forgiving, just as God has forgiven you in Christ. Be imitators of God as His dear children. Follow the way of LOVE, even as Christ LOVED YOU. He gave Himself for us as an offering to God, a gift of pleasing fragrance. 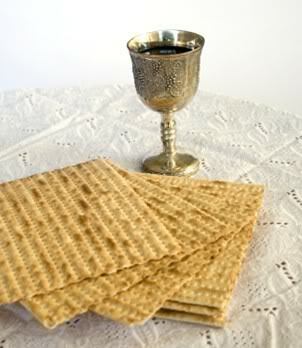 When Peter and John found everything as Jesus had said, they made ready for the celebration of the Passover according to the Essence calendar, which, according to the Dead Sea Scrolls, celebrated the Passover two days before the rest of Jerusalem. 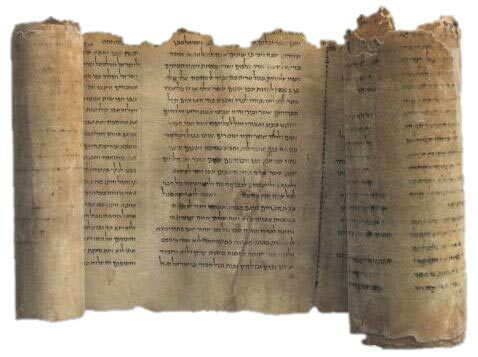 It is important to NOTE: the Dead Sea Scrolls are the records of this ancient community that lived outside of Jerusalem and paid STRICT ATTENTION to the ritual purification requirements of the Law as well as other requirements not readily observed by average Jew. It is quite possible that the house, which Jesus came to, was something of a preparatory location for those who wanted to become full members of the religious group – similar to the formation houses that Religious communities have today. At any rate, Jesus followed this calendar and celebrated the Passover with His disciples on Thursday (our calendar) and not on Saturday (our calendar) when the rest of Jerusalem would celebrate the Passover Feast (When I say ‘our calendar’, I’m speaking of the difference between the Roman calendar – which we use – and the Lunar calendar which the ancient Hebrew people used). 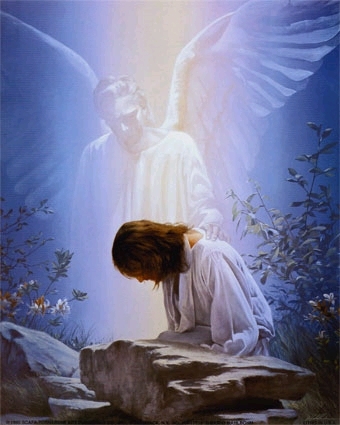 Jesus celebrated Passover on Thursday and was crucified, died, and was buried on Friday, so the Agony in the Garden (1st Sorrowful Mystery), must have also occurred Thursday but in the evening. All four (4) Gospels bear much of the Passion, from the Institution of the Eucharist (beginning), to the account in the Garden at Gethsemane (middle) concluding with His Crucifixion and Death (end). I will flow back and forth, giving the reader the fullness of the Gospel accounts of Him who was “made sin for us” and died to free us from that sin, emphasizing a few minor details to keep the picture in perspective. Who was to carry on the work that Jesus began? Kind of obvious, isn’t it? Those whom He had chosen. The Apostles that numbered 12, although one of them would betray Him. WHAT DID JESUS ASK THEM TO DO? 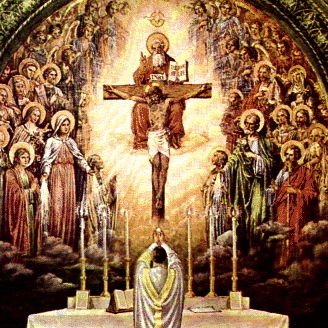 So the Apostles, in repeating the words of Christ, are then able to re-create the Last Supper, bringing the Eucharist from bread and wine, and becoming the Body – Blood – Soul – and Divinity of Jesus Christ, JUST AS JESUS DID at the Last Supper! …they appointed others to take their place and assist them in the work Jesus called them to. And who are the successors of the Apostles? The Bishops! And who do the Bishops appoint to assist them? The Priest! All Bishops & Cardinals are priests elevated to a higher calling. Once a priest, always a priest. The mark of Holy Orders is indelible – permanent. Ta-dum! The institution of the Priesthood! “As the Father has loved Me, so have I loved you; abide in My LOVE. If you keep My commandments, you will abide in My LOVE, just as I have kept My Father’s commandments and abide in His LOVE. The Parable of the Faithful Steward: Be on the alert. You know not the day or the hour when an accounting will be asked. The Parable of the Ten Wise and Ten Foolish Virgins: Stay awake! The Parable of the Talents: Well done! Good and Faithful Servant! There is a hint of danger and disaster in the air. 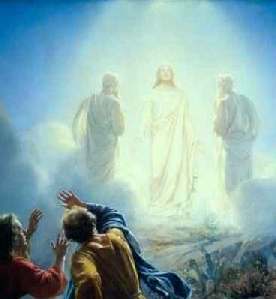 These parables are followed by the Parable of the Last Judgment, as they look down on the Valley of Jehoshaphat, Jesus giving them His commandment of unconditional love. ~Fr Clifford Stevens, Homily, Wednesday of Holy Week. 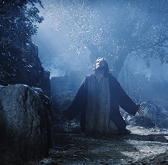 The stage is set for what none of them believed or accepted: the complete failure of this Prophet of Nazareth, the final disaster that Jesus has constantly told them about…and for the mightiest work of God in the history of Israel. ~Fr Clifford Stevens, Homily, Wednesday of Holy Week. Now, there has been much speculation surrounding the person of Judas Iscariot, speculation that I wish to lay to rest here and now. Thus – Judas Iscariot was a traitor, a liar, and a thief and had nothing to do with the common heart of LOVE that Jesus imparted to the other Eleven Apostles. DID JUDAS RECEIVE THE EUCHARIST…? “Judas…couldn’t perceive the gift being offered to him or identify the One giving it. 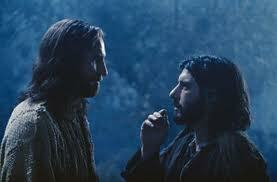 Even after all the time he had spent with Jesus, Judas still couldn’t accept Him in the way Peter and the others had. His heart hardened by the choices he had made, was closed. As a result, he ate and drank his own condemnation.” ~Word Among Us, devotional, Tuesday, April 19th, Holy Week. Whoever, therefore, eats the bread or drinks the cup of the Lord in an unworthy manner will be guilty of profaning the BODY and BLOOD of the Lord. Let a man examine himself [CONFESSION], and so eat of the bread and drink of the cup. For any one who eats and drinks without discerning the body eats and drinks judgment upon himself. I am astonished that you are so quickly deserting Him who called you in the grace of Christ and turning to a different gospel– not that there is another gospel, but there are some who trouble you and want to pervert the gospel of Christ. Was [Judas] disillusioned and beginning to realize that Jesus is not going to declare Himself the new king of Israel, and that, instead of being part of a glorious triumph over Israel’s oppressors, He is going to seem part of a giant conspiracy to overthrow the government [cf Jn 11: 49b-50]? There are those who think that, after viewing all the miracles of Jesus and His power over wind and wave, and even death itself, Judas wanted to stir Jesus into action, as so devised a situation where He would have to act, after all, did the Master not tell His disciples to bring their swords along to Gethsemane [Lk 22: 37-38]? Was [Judas] really a guerilla-fighter all along, and is it true, as some scholars believe, that his name … has been mistranslated and …[is] really Judas the Sicarii, one of the political assassins whose hatred for the Romans drove them to violence and that, when Jesus did not share their plans for revolution, decided to get rid of Him…and follow another leader, perhaps one named ‘Barabbas’? ~Fr Clifford Stevens, Homily, Tuesday of Holy Week, addressing the misunderstandings surrounding Judas Iscariot, emphasis added by me. I have betrayed innocent blood! It’s this speculation that IGNORES what we know of Judas – what the SACRED SCRIPTURES tell us of Judas Iscariot. 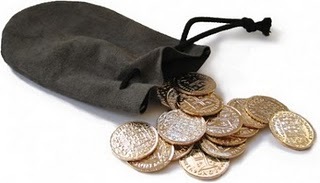 IF Judas was a revolutionary, and his “steeling funds” was part of a fund raising effort to finance that revolution, WHY THEN did he violently return the 30 pieces of silver – a day’s wage – to the Pharisees claiming that he had betrayed innocent blood? Wouldn’t he NOT HAVE CARED? 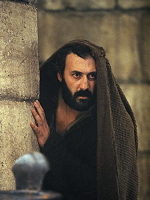 Instead, would Judas not have worked with his fellow revolutionaries to free Barabbas and begin the revolution? Not the actions of someone who would be full of hope in starting a revolution. Or someone who was sure that Christ would bring His kingdom to earth to spare His Crucifixion. 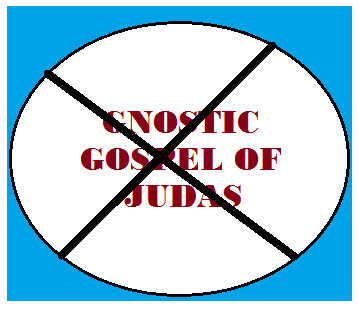 Thus PROVING CONCLUSIVELY that Gnostic Gospels SHOULD BE LEFT ALONE by all faithful followers of Christ! If you have a strong enough stomach, you can read in Acts 1: 16-20, about what happened when some of the Apostles finally discovered Judas hanging on that tree outside of Jerusalem. …not My will, but Your Will be done. THE DIVINE MERCY NOVENA BEGINS TODAY! Visit HERE… It’s printable, too. Christ suffered for you and left you an example, to have you following His footsteps. He did no wrong; no deceit was found in His mouth. When He was insulted, He returned no insult. When He was made to suffer, He did not counter with threats. Instead, He delivered Himself up to the One who judges justly. In His own body He brought your sins to the Cross, so that all of us, dead to sin, could live in accord with God’s Will. By His wounds you were healed. But until then, let us begin our focus, that is The Passion of Christ that leads to His Resurrection and gives us a better understanding of the Mercy that is ours, especially on DIVINE MERCY SUNDAY, the SECOND Sunday of Easter. This is My Beloved Son, with whom I am well pleased. Listen to Him. Father if it be possible…Not My will but Yours Be done! Three times Jesus prayed, three times He struggled against the temptation to give in to the flesh and flee from what was before Him. But Jesus knew His Father would strengthen Him in His most desperate hour of need. Resolved and ready to face what Jesus knew needed to be for the Salvation of the World, and the fulfillment of the Promise the Father made to Abraham, Jesus went to His chosen friends to WAKE THEM UP and prepare them for the Unthinkable! One other thought of profound significance… Could this also be for US? 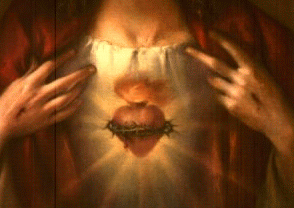 Has not our Lord sent His Blessed Mother to us numerous times to try and WAKE US UP! to the sins we are committing and the fruit of death that we are now harvesting? WAKE UP! For our betrayer is at hand! Cling to Christ, He is our ONLY SALVATION! Would you betray the Son of Man with a kiss? Peter will gather his brethren together during Holy Saturday and await for the news of Jesus Resurrection as witness by the women…but I’m jumping ahead. Words, that if you did watch Mel Gibson’s Passion of the Christ, that were uttered by Jesus when He met His mother on His Way of the Cross. Jesus’ Passion and Death DID make all things NEW! 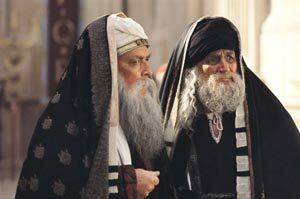 “…the high priest [Caiaphas, this year] who is a puppet of the Romans and remains in power only as long as he is in favor with them, remembers the terrible destruction [of Jerusalem] under Pompey… fears that this will happen again, if some self-proclaimed Messiah stirs up the people again. National aspirations and the restoration of the Kingdom of David is in the air.” ~Fr Stevens, Homily, Saturday of the 5th Week of Lent. …Judas the Cicarii, one of the political assassins whose hatred of the Romans drove them to violence… ~Fr Clifford Stevens, Homily, Tuesday of Holy Week. 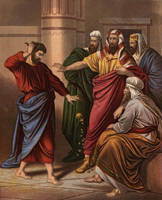 Pilate had the power to release Jesus (Jn 19:10), but he also knew that TRUTH was not something he wanted to deal with. 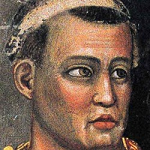 Pilate’s truth existed in maintaining his head on his shoulders, and to go against Caesar meant losing that head. “If you release this Man, you are not Caesar’s friend; every one who makes himself a king sets himself against Caesar!” ~Jn 19: 12b, emphasis added. 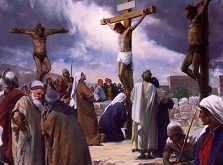 Jesus is lead off to be put to death, a criminal’s death for He had two criminals crucified along with Him (Lk 23:32). His hands and feet were fixed to the Cross, His garments were divided among the soldiers (Jn 19: 23-24), and prophecy upon prophecy was fulfilled (Ps 22:18, Ps 69:21; Is 2-6, Zech 12:10), and most importantly sin lost its grip on humanity! 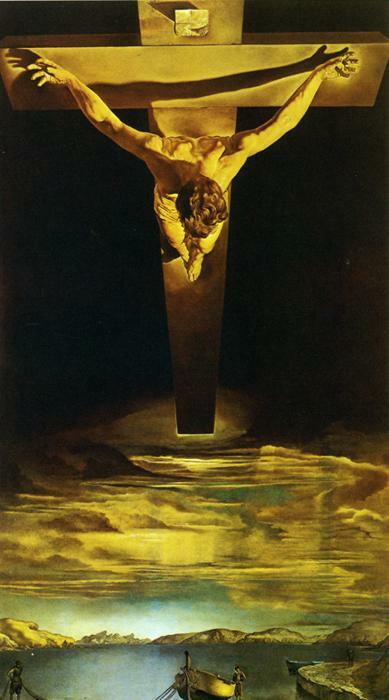 And it is because of that Resurrection Christ gives us His most GLORIOUS GIFT – His DIVINE MERCY! Watch and REMEMBER what our Lord, Jesus Christ, SUFFERED for US!